The last time I was in Ushuaia was half my lifetime ago – a time before mobiles and internet cafes, let alone selfies. Back then my visit was part of the two-month trip that introduced me to South America. One of the things we were able to do back then was a daytrip along the Beagle Channel over to Puerto Williams on Chile’s Isla Navarino. We set off in the morning and all was calm and sunny and once there, we enjoyed a hearty lunch with wine having written & posted our postcards from the southernmost post office in the world. The trip back to Ushuaia was a different matter – a huge swell meant that our little catamaran was thrown around all the way home and the inevitable happened – I (and many others, including the captain) fed the fish of the Beagle Channel. Several times. So here I am in Ushuaia again and not only am I planning to repeat the navigation along the Beagle Channel but this time, my trip is also going to take me past Cape Horn and another 600 miles or so south across the Drake Passage – one of the world’s most infamous stretches of water – to the Antarctic peninsula. What am I thinking? I’m no sailor. This time though, I’m on a cruise ship. With stabilizers no less. 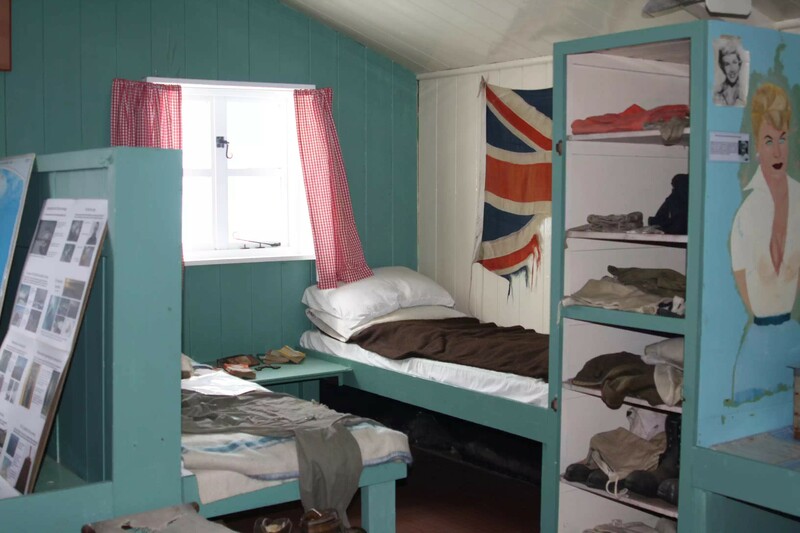 Our cabin on the Sea Explorer is to be our home for the next 10 nights and in no time at all, we’re all settled in – and OMG, we’re moving and I can’t even feel it! A couple of hours later, we glide past Puerto Williams. Next stop Antarctica – but first, there are people to meet, safety briefings to attend and more importantly dinner. Darkness falls and an announcement fills me with joy – the weather forecast is for a smooth crossing and I go to bed feeling smug. Our wake-up call the next morning confirms that we’ve made great progress and if we’re lucky, we may even to get to do our first landing that afternoon. Breakfast is well attended and there’s lots of excited chatter about our incredible progress and everything’s going swimmingly. Until I start to feel swimmy – and here we go again. I venture out of my cabin and find that sickbags have been strategically placed in the corridors. Not just me then. I retreat back to my bed and the announcement that follows explains why I’m feeling rough – there’s a storm. (Coincidentally, this storm is what got us across the Drake in super quick time, as the captain was keen to get us the shelter of the South Shetlands but it’s also scuppered the potential landing that afternoon – no chance with those waves and Force 9 winds! In fact it was another 24 hours before we got our first landing – Deception Island. Prior to setting off on this trip, I’d poured over maps of Antarctica and been glued to an app called Marine Tracker where you can track cruise ships and this almost bagel-shaped island had caught my eye from day one – when I learnt that this was to our first landing, I nearly burst! The reason for its extraordinary shape is volcanic – it is the huge caldera of an active volcano. The journey into the caldera takes us through Neptune’s Bellows – the opening is not only less than 250m wide, but also home to Ravn Rock which lurks a mere 2.5m below the surface. In 2007 a large cruise ship sustained a 25m gash in her hull; no one takes this navigation lightly. Once through, we anchor, and get our first chance to put our newly-acquired Zodiac skills to the test as we leave the safety of our ship and venture onto the stony shore. 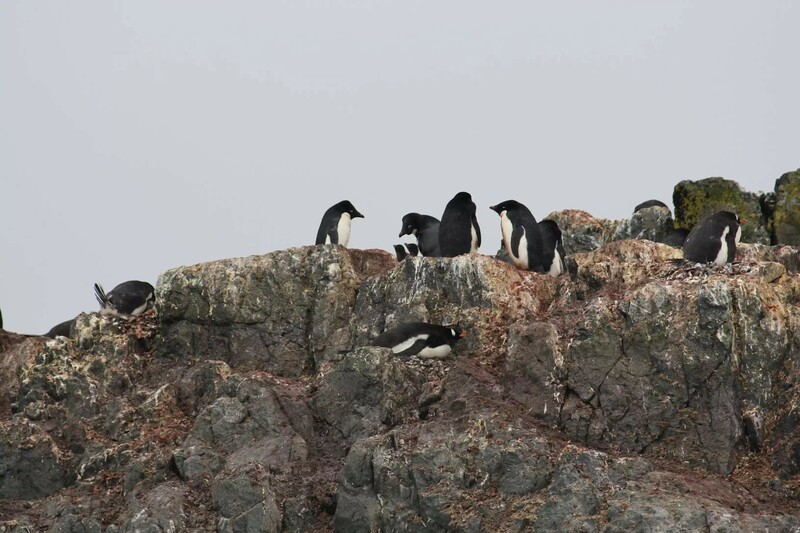 We’re met by a number of Chinstrap penguins who go about their business as usual as we walk up and down the beach, being careful not to stray beyond the boundaries marked out by our Expedition Team members, and not to get too close to the wildlife. Antarctic waters are cold but with Deception Island being active volcanically, the water lapping the shores was steaming. A couple of hardy souls take the plunge and are rewarded later with a certificate. If I’d known there was a certificate…. Over the next five days, we enjoy six more landings and several Zodiac cruises. We meet masses of Gentoo penguins – with it being mid-December, the nests are 100% occupied as the chicks aren’t due to hatch for another week or so. Keeping an eye out for Skuas is a full-time job – these big brown predators dive down from the sky and are partial to penguin offspring (hatched or otherwise). 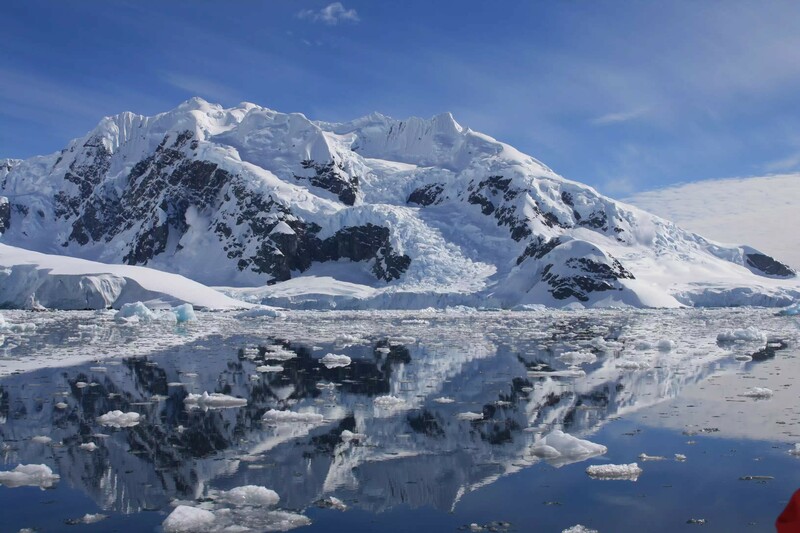 Two of these landings take us onto the Antarctic Peninsula itself – Neko Harbour and Paradise Bay. Along with a number of my fellow passengers, I mentally tick off the seventh and final continent as I step out of the Zodiac onto the shore at Neko Harbour. At Paradise bay, the steep hike up to the top of the bluff is worth every slippery step for both the incredible views over the bay and the opportunity to toboggan down again. The Zodiac cruises are really special, particularly if the waters in the bay are calm – the outboard motor is switched off and we float in silence on the mirror-like surface, the only sound being chunks of ice bumping off the rubber sides of our Zodiac as we drift between icebergs of all sizes, shapes and colours, while keeping an eye out for surfacing whales or ‘porpoising’ penguins. A distant rumble indicates an avalanche or calving glacier but it’s far enough away not to cause us any concern. 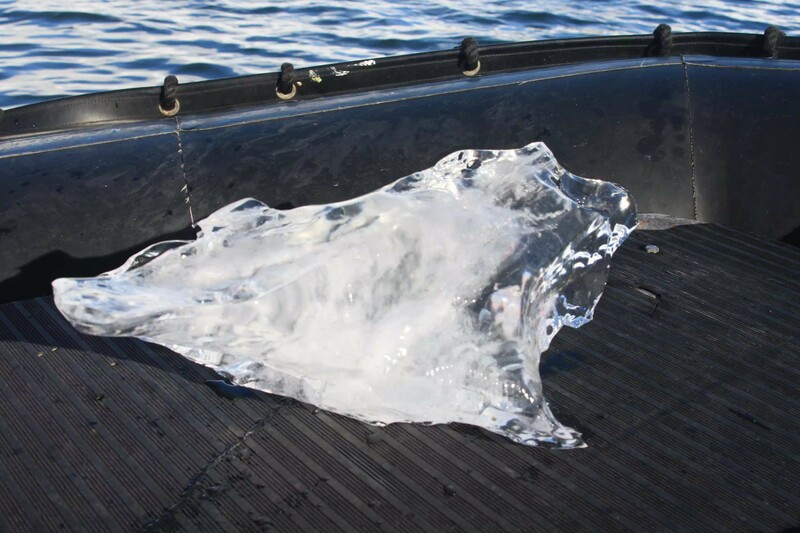 We get going again and our Zodiac driver is on the lookout for a suitable chunk of “black” ice. This ancient crystal-clear glacial ice is the only thing that can be taken back to the ship and once we’re back on board, it’s delivered to the bar and adds a certain je ne sais quoi to our Gin & Tonics later that evening. Our last couple of landings bring us into contact with some humans – namely Port Lockroy, (featured in the BBC’s “Penguin Post Office” documentary) and the Russian base at Bellingshausen on King George Island, where a small recently-constructed Russian Orthodox Church dominates the skyline. Nearby Ardley Island comes up trumps us to give us a couple of final treats – two tiny Adelie penguin chicks, and the chance to see all three of our penguin species – Chinstrap, Gentoo and Adelie – at the same time. 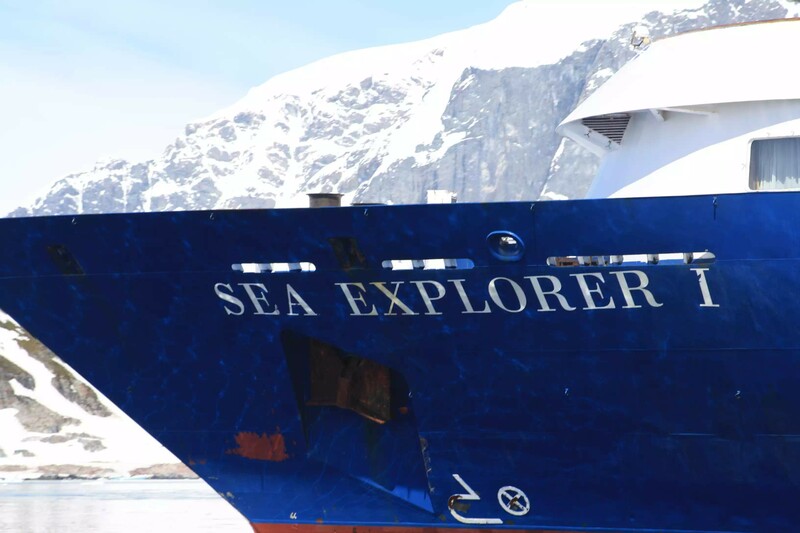 It is with heavy hearts that we bid farewell to this fascinating destination and head north across the Drake Passage. 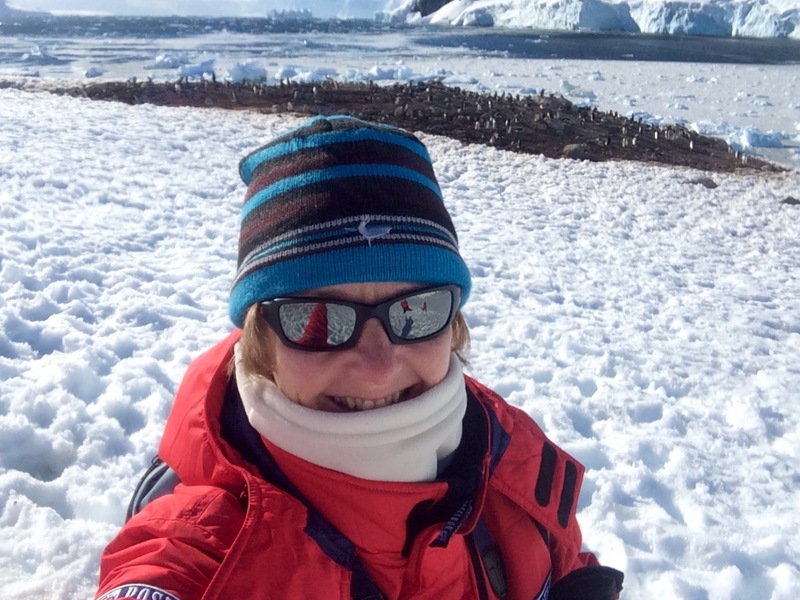 Goodbye Antarctica – stay safe and pristine. For more information on Antarctica, click here.